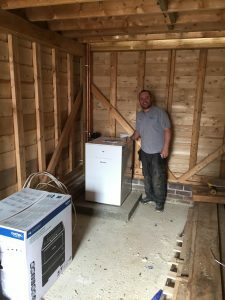 Separate to the main house renovation the new office/ garage annex has been framed and a plinth set for a new Worcester Bosch combination oil boiler. The condensate waste needed plenty of additional limestone around it as the soil with heavy with clay, this would not have allowed the boiler to drain its waste. With some additional frost protection, a wireless room thermostat that also controls the central heating times and a magnet system cleaner this boiler is set to provide heating and hot water long into the future.